START 30th AUG! 6 WEEK Adults Kickboxing Beginners Course! 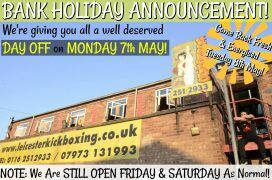 We’re giving you a break Monday 7th May Enjoy the Weather and see you back on Tuesday 8th as normal . 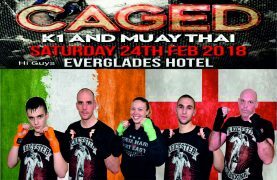 FIVE of our very own fighters will be representing in IRELAND all under K1 Rules. The event will take place in Derry Northern Ireland on the 24th Feb 2018. Adult’s beginners course start Thursday 21st Jan 2016 Special offer for beginner’s course. Starting Thursday 21st Jan 2016 only £35 for the six weeks . So if you have been thinking of a new challenge or wanted to get back into training why not give our kickboxing a go real training for real results.